Looking for a professional fish finder to assist in your fishing ventures and clear the guesswork? Your options are quite diversified and buying a random unit can seriously cause some frustration. Whether it is too complicated to use or it lacks essential features, these are the last things you want. Some options are better than others; however, it is all about your actual needs. Go on with this Garmin Striker 4 review to discover one of the best rated items in commerce – for both newbies and more advanced users. But before going into small details, make sure you know what to pay attention to when buying a fish finder. Here's a quick recap what we think about this device. Coming in a compact size and weighing just over 11 ounces, Garmin Striker 4 is backed by a powerful warranty and offers basic features and a few bells and whistles. It can successfully compete against expensive fish finders from more prestigious manufacturers. The display measures 4.3 inches in diagonal. It is, indeed, significantly lower than in other units. Despite this fact, it provides access to all the information you need – cover, structure, species and baits. The HVGA color carries the same standards. It is not the ultimate technology on the market, but it will get the job done. You do not want to spend a fortune on a gadget that does the same thing, but displays it better, do you? The maximum resolution is 480 x 320 pixels. Also, it comes with backlighting. Even if it is dark outside or the weather is not too friendly, you can still see what you are doing and where you are going. 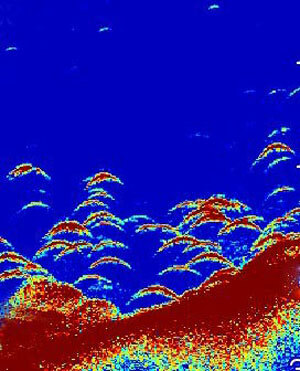 You might expect the Chirp technology in high end fish finders only, so this model might surprise you. Given this aspect, it obviously gives you a good value for money. The way the Chirp technology works is easy to understand. The frequency must be high for small objects to be observed, but it should also be low for soft river beds. This technology sends out more signals at the same time and not just one. It is highly recommended to travel at low speeds for maximum accuracy though. Most experts recommend up to 6MPH, but do not be surprised to find a Garmin Striker 4 review claiming on positive results at higher speeds. Just find out what works for you based on the type of water. 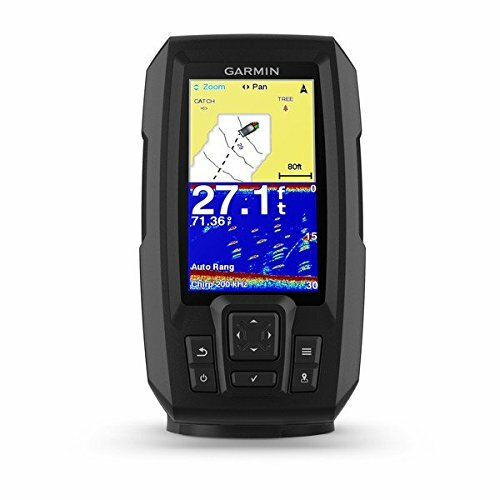 The Garmin Striker 4 portable unit features a solid 010-10249-20 transducer. It comes with a four pin connected and relies on two different cones – 15 degrees on 200kHz and 45 degrees on 77kHz. The good news is the main unit can easily do 50/77/200kHz. Therefore, you can get a separate 50/200kHz transducer as well. It will allow scanning at higher depths. It is worth noting that it cannot do Low Chirp, but only Mid and High Chirp. Depth is a bit tricky. This fish finder will go to a maximum depth of 1,600 feet in freshwater. If you mostly fish in saltwater, it will not exceed 750 feet. However, such a depth can only be achieved with a different transducer – a 50kHz one. The transducer in the package can go to around 800 feet. Fortunately, replacing the default one is piece of cake. Just like setting up Garmin Striker 4, it should be a matter of minutes only. Unless you are a professional fisherman, chances are you will not need it anyway, as the default depth is good enough for lots of species. The GPS system implemented in Striker 4 works on some basic principles – no funky features, but just what you need. It is designed with high precision in mind and allows marking way points for a more organized experience. However, it will not display coordinates. 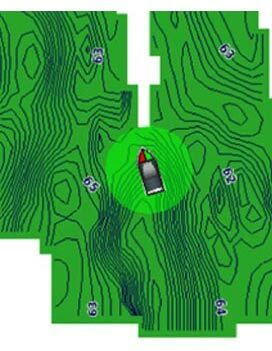 Organizing way points allows finding good spots again and adds to the overall safety. There are 5,000 different way points to use. If you change waters on a regular basis, it might be wise to reset them before changing, only to save the space. There are no Garmin Striker 4 maps by default. Basically, there has to be some connectivity or the whole gadget is useless. Luckily, it comes with two associated data cables. Not having any maps might seem a little inconvenient, as you will have to do some work before taking the fish finder on water. But on the bright side, it gives you the option to choose your map provider. The same cables can be used for any type of data transfer. At first, you will find the design a bit rugged. It is sturdy though and IPX7 waterproof. It can take water splashes, heavy rain and even handy for ice fishing. It can also resist immersions up to 3 feet in freshwater. It is not recommended though. Saltwater is more corrosive, so try to keep it dry. A tilting mount is included in the package for easy installation – also the power cable. Other features include Ultrascroll, Fish Symbols, A-Scope and Flasher, among others. There are no fancy bells and whistles that no one can find a use for anyway. The cone angle is often ignored when checking features and specifications. Try to imagine it as a beam going from the boat to the water. It goes wider as it leaves the boat. A long depth obviously scans a wider area. But the same goes for the cone angle. Most commonly, transducers vary between 9 and 60 degrees. If you plan to ship in different waters, opt for a cone angle between 16 and 25 degrees. The transducer material is just as important. Most of them are based on plastic and can be mounted on any kind of boat. You will also find transducers with steel or aluminum housing for more durability. Plastic is preferred for a safety reason – metallic transducers should not be installed if the boat has a positive ground feature. Other critical considerations in the process include the frequency range, depth, display size and resolution and power. 1. Do I need any tools to mount the fish finder on my boat? There are no tools required for the mounting. Everything you need is included in the package. The mounting system is compatible with almost any type of boat. The whole process takes a few minutes and can be found in the manual of instructions. 2. How long can the fish finder be immersed for? There are no specifications regarding the amount of time. It can take a few feet of immersion in freshwater though – only as an accident. The situation can be worse if you drop it in saltwater because it is highly corrosive. 3. What do I need to use the fish finder out of the box? Since it has no maps, this is everything you need to be able to use it. Use the data cables to transfer information, maps, updates and even way points. In conclusion, this Garmin Striker 4 review covers everything you need to know for an informed decision. It offers plenty of features at a low price, while its minuses are insignificant and will not affect your experience. 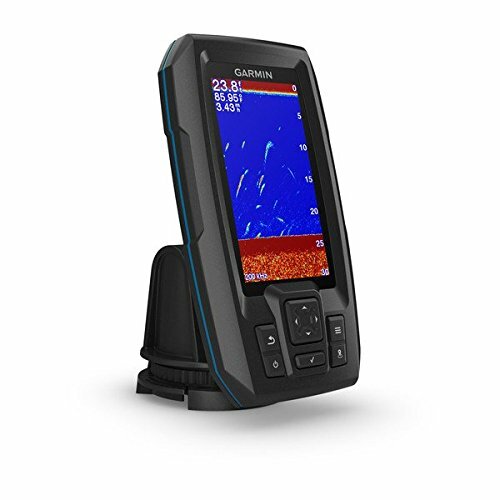 It is currently among the highly rated fish finders on the market.